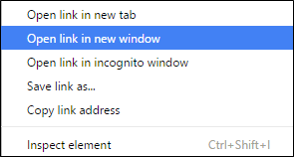 There's a quick way to force a link to open in a new tab window in most browsers. Perhaps you've found a site with a page full of links. Rather than clicking each link and then having to go back to the main page, these tips will force any link click to open in a new tab window. It's easy to return to the main tab window and delete the newly opened tab if needed. 1. Hover over a link, and right-mouse click. Select "Open link in new window". 2. Hover over the link and press the Ctrl key and click the link.